So, who wouldn't want a TV you could control with your phone? Roku is my all time favourite streaming device, and having it built into the phone would be awesome (I reviewed the Insignia one a while back). Maybe I should grab this new Sanyo TV with it built in, rather just buy their new stick. RUTHERFORD, NJ, May 1, 2018 – Funai Corporation, Inc., the exclusive North American license partner for Sanyo consumer televisions and home video products, today announced a new TV series that runs the popular Roku® OS, to be available at Walmart Canada in-store and online starting early May. The new Sanyo Roku TV series includes four screen sizes – 32-, 40-, 43- and 50-inch. All four sets feature outstanding Sanyo TV picture and sound performance and run on the easy-to-use Roku OS. Roku’s customizable home screen allows consumers to organize their favourite streaming services and inputs, such as antenna, cable boxes and gaming consoles. To find new entertainment, consumers can search for actor, director, TV show or movie title through the universal Roku Search feature. Sanyo Roku TV users in Canada get access to 150,000+ movies and TV shows across 5,000+ free or paid channels. 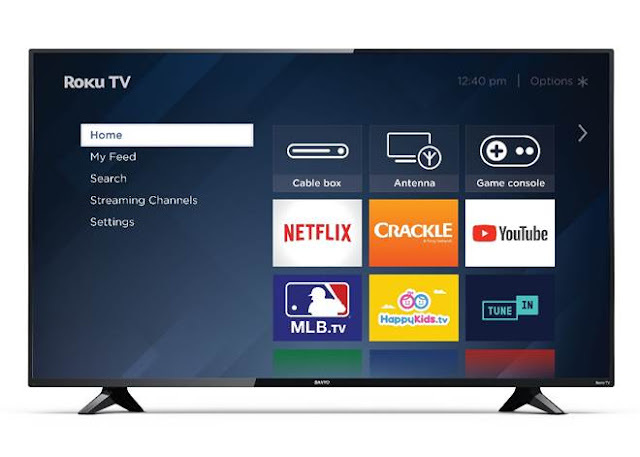 Sanyo Roku TVs are also compatible with the Roku mobile app, allowing consumers to control their Sanyo Roku TV from a mobile device and use other features such as voice search and private listening. The new Sanyo Roku TV series offers Full HD resolution, 120 Brilliant Motion Rate to provide clear and vibrant images in fast action scenes, and wireless LAN 802.11ac MIMO for seamless streaming.